Tony Bylsma replies to the ultimatum, complaining that the district is being "pressured" to scrutinize Narconon. Kim Coates issues an ultimatum to Tony Bylsma: remove the inaccuracies or else. Tony Bylsma responds to Kim Coates with his defense: a lengthy, arrogant snow job. Narconon scares local citizens in the United Kingdom, according to this article in This is Kent. Bobby Wiggins (who does all the Narconon presentations in Boston) is apparently on tour. Locals distrust Narconon because they recognize it as a recruiting tool for Scientology. Meagan Porpora's story: Scientology's Mace-Kingsley ranch scarred me. Narconon banned from Edinburgh University student union due to illegal postering, and the group's "strong links" to the Scientology cult. Story from The Scotsman. Kim Coates writes to Tony Bylsma about "inaccuracies" in the Narconon materials. Scientology cult aims at kids' shows. Australia's Herald Sun reports that Scientology has been using front groups called Drug Free Ambassadors and Kids for a Drug Free Future to gain access to several community events in the state of Victoria. Local officials were not pleased when the deception was uncovered. An official complaint against Narconon Newport Beach was filed with the Newport Beach fire chief and city manager on January 30 by Dr. Linda Orozco, whose house is located near the Narconon rehab facility. Orozco, a professor at Cal State Fullerton, alleges numerous zoning violations by Narconon and requests a "declaration of nuisace & abatement" against the facility. The Federal Office of Civil Rights is interested in hearing from parents of minority or Special Education students who are concerned about their children being exposed to Narconon/Scientology presentations without their knowledge or permission. Please call them at 415-556-4246 or 415-556-4275 to voice your concerns. SFUSD backs down: this web site is no longer blocked from SFUSD computers. Somebody lose their nerve? We still want to know who was responsible for the block. Stay tuned. SFUSD has blocked access to this web site. What are they afraid of? This web page goes public. Narconon lecture in Providence, RI elementary school reported by the Providence Journal. Work began on this web page. Scientology-based reading program "Project CALL" sneaks into Texas. Tony Bylsma, Executive Director of Narconon Drug Education, Inc., writes to SFUSD health coordinators. Sigal Adini writes to health coordinators at schools throughout SFUSD. Where did she get their names and addresses from? The SHPD admits it improperly released this information. Narconon presentation at Philip and Sala Burton High School. This was a summer session held for special education students. Narconon presentation at Abraham Linlcoln High School. Lower grades. Narconon presentation at New Traditions School. Narconon presentation at Abraham Linlcoln High School. Upper grades. Narconon lies about its ties to the Church of Scientology, while funneling money to the International Association of Scientologists and other Scientology groups, and receiving money from them as well. Within Scientology, Narconon is known as "the bridge to The Bridge": a recruiting tool to lure in new members. Narconon's unaccredited rehab program endangers people's health with a medically indefensible treatment regimen that poses a significant risk of liver damage. Narconon engages in covert religious instruction by incorporating the Church of Scientology's "training routines" (TRs) and "study technology" into its treatment program (see Narconon's Therapeutic TRs course and Learning Improvement course). 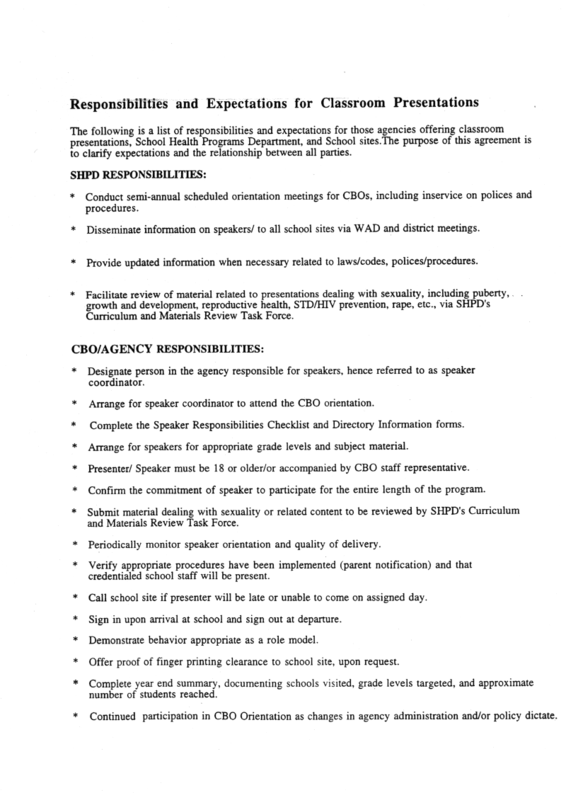 An organization that behaves the way Narconon does has no business sending speakers into the public schools. Its parent organization, the Church of Scientology, is a dangerous cult that sometimes kills its own members. 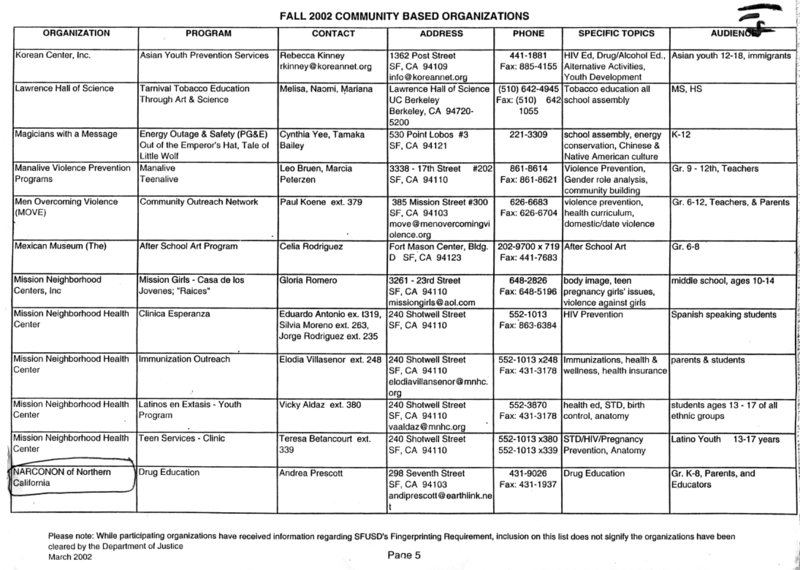 Fall 2002 Community Based Organizations (CBO) list issued by the SFUSD, showing Narconon of Northern California. 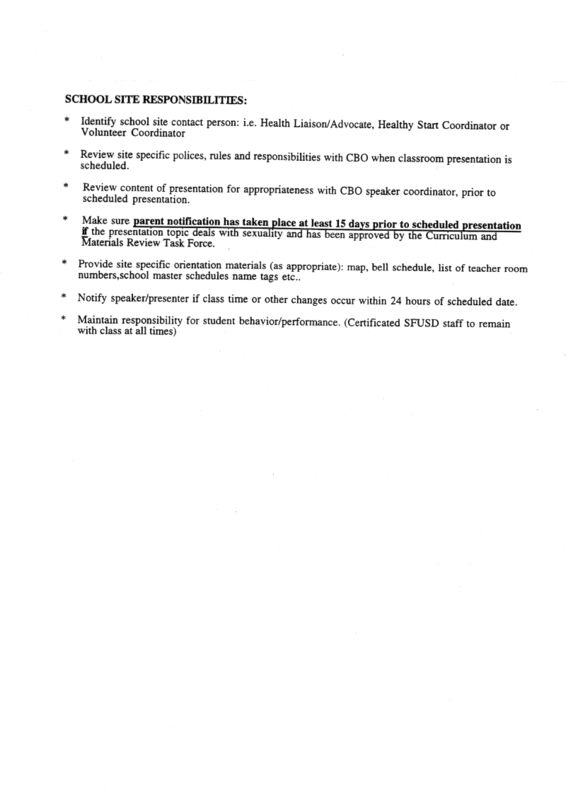 The accompanying "suggested speakers list" on the topic of substance abuse shows Narconon recommended for grades 3-12. 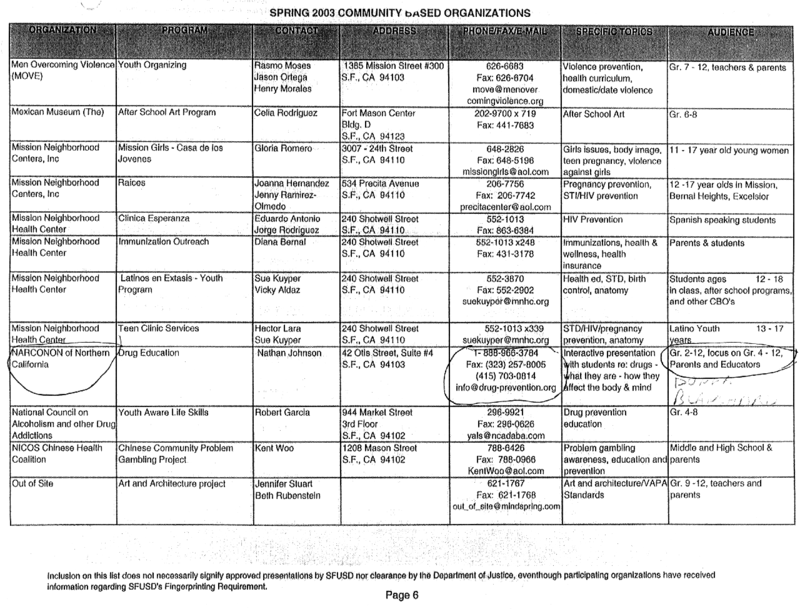 Spring 2003 Community Based Organizations (CBO) list issued by the SFUSD, again showing Narconon of Northern California. The disclaimer at the bottom of the page was added after questions were raised about Narconon's inclusion in the 2002 listing. 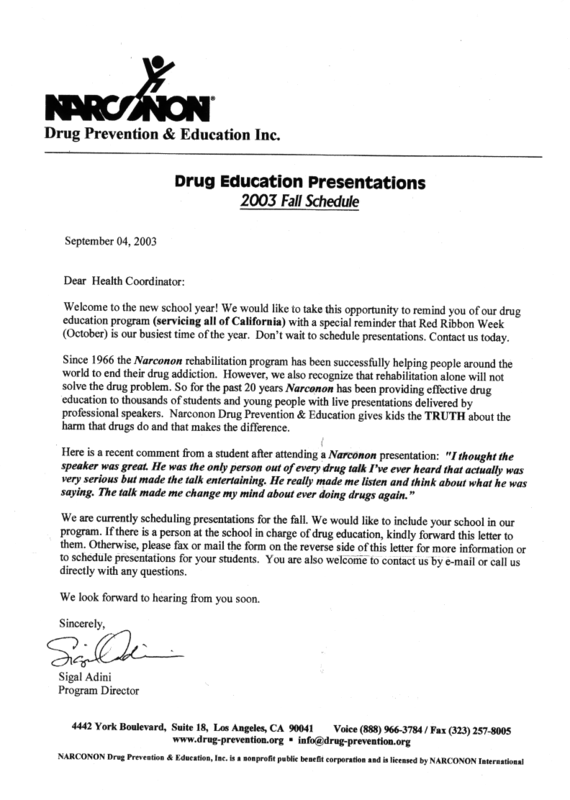 September 4, 2003: Narconon Drug Prevention and Education letter, sent to teachers in the SFUSD responsible for health education. The reverse side contained this speaker scheduling form. The letter is signed by Sigal Adini, who writes on her web site, "I have been in Scientology for most of my life." 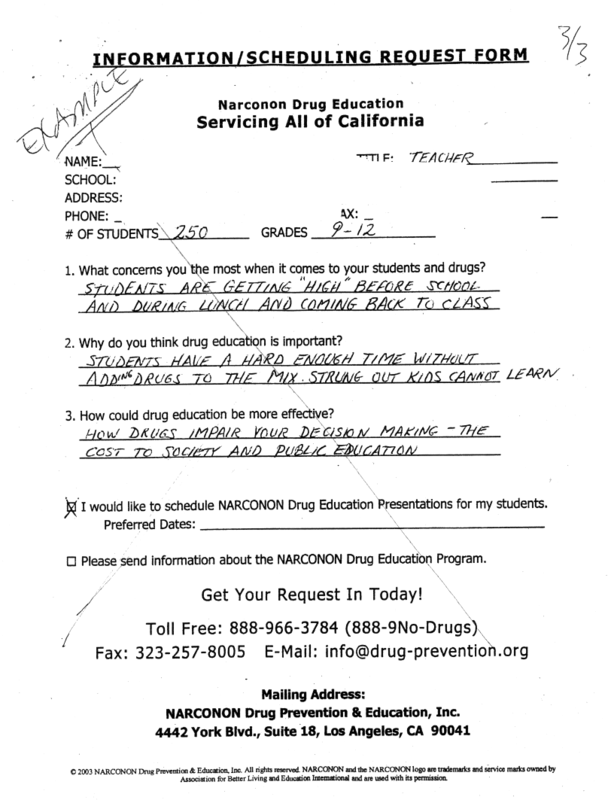 California public school teacher references offered by Narconon Drug Prevention & Education, Inc. in 2003. 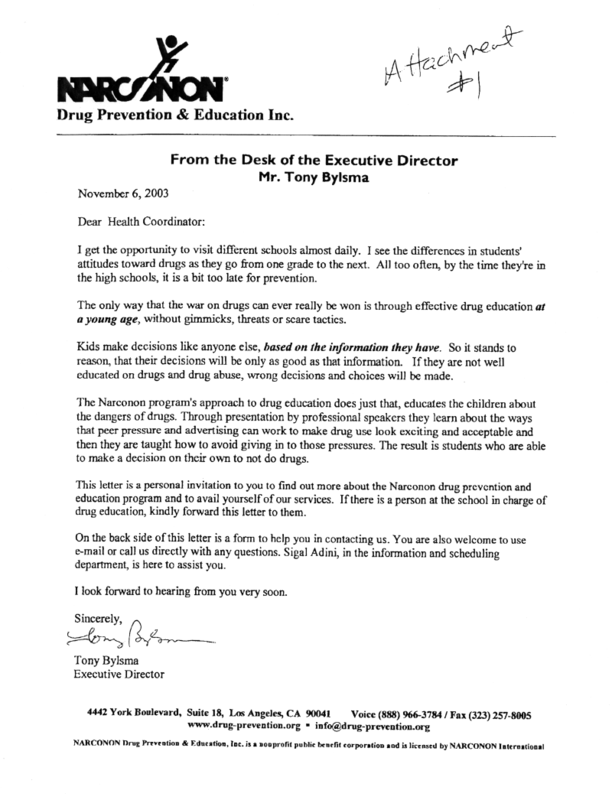 November 6, 2003: letter from Tony Bylsma, Executive Director of Narconon Drug Education, Inc., to SFUSD health coordinators, soliciting invitations to speak at their schools. How did he get the names and addresses of these teachers? See below. November 12, 2003: letter from Sigal Adini (and page 2 ) to Martha Adriasola at the SFUSD School Health Programs Dept. Adini flat out lies about Narconon having no relationship to Scientology, while Scientology happily boasts on one of its own web sites that Narconon arose from and is based on Scientology practices. Narconon Drug Prevention & Education Program brochure sent to schools in 2003. On page 4 of this document, Narconon falsely claims a positive evaluation from an "independent" study conducted by FASE (Foundation for Advancements in Science and Education.) The truth is that FASE is a Scientology front group, just like Narconon. It was set up to promote the works of L. Ron Hubbard. FASE also endorsed Scientology's bogus "detox" treatment that Tom Cruise has been flacking to New York City firemen. 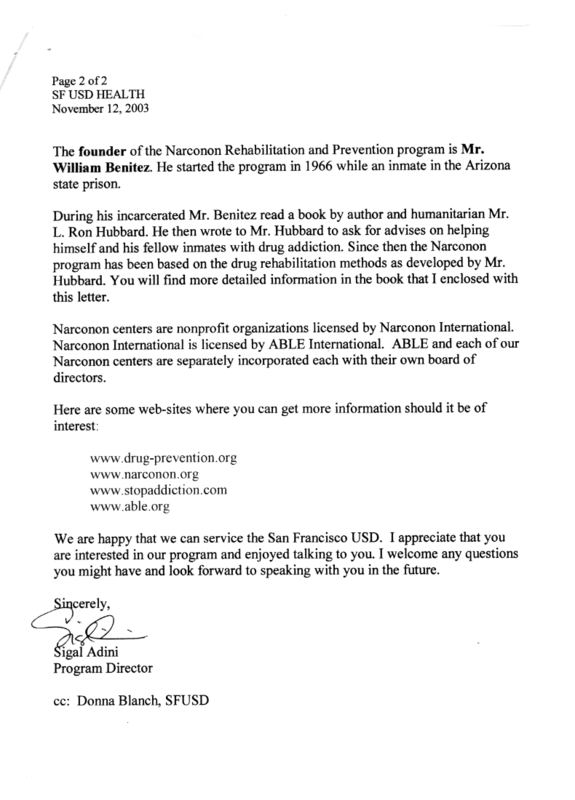 January 2003 grant application from ABLE, Narconon's parent organization, seeking funding for its literacy programs. 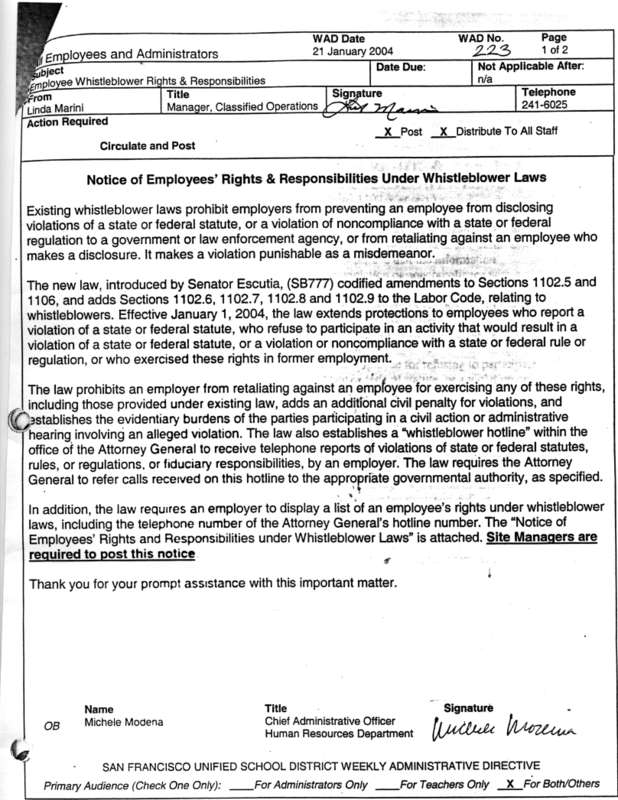 This 1993 IRS letter to ABLE, confirming its 501(c)(3) status, was included with the grant application. For more about Scientology's use of literacy programs to infiltrate public education, see StudyTech.org. These presentations took place because the director of the School Health Program (Trish Bascom) and the teachers at these schools did not know that Narconon is Scientology! NOTE: the federal Office of Civil Rights, in downtown San Francisco, would be pleased to hear from any parents of minority or Special Education students in the San Francisco Unified School District who are concerned about the Narconon Drug Education program that their children were exposed to without their knowledge or permission. Please call 415-556-4246 or 415-556-4275 with your concerns. Narconon put together a collection of feedback forms from the children , which it's now using to promote itself to other SFUSD schools. Many of the schools listed above have a high percentage of minority students. Scientology has also been found to be targeting minorities with education related programs in Massachusetts and Harlem. 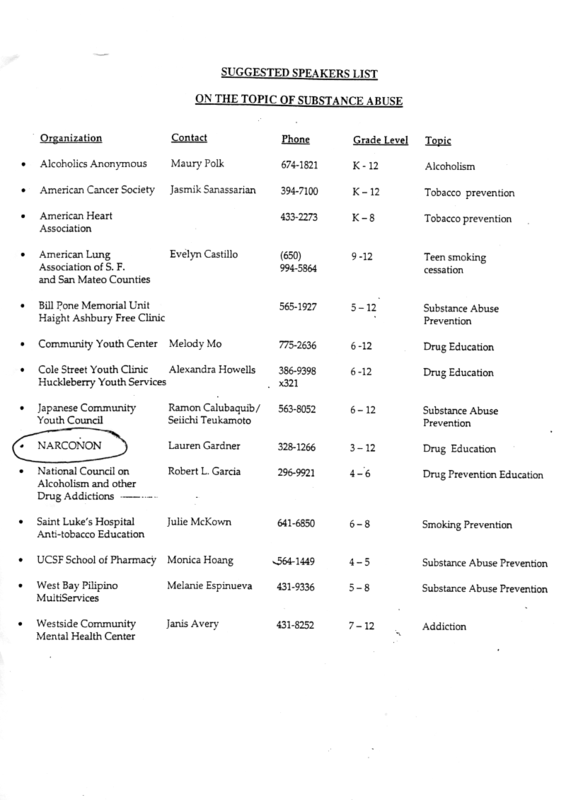 The SF Unified School District has known about Narconon's infiltration efforts since 2002. Why haven't they thrown Narconon out? Ask Kim Coates in the School Health Programs Department, who has been quietly running interference for Narconon. And ask Dr. Arlene Ackerman, Superintendent of SFUSD, why neither she nor the school board have acted. 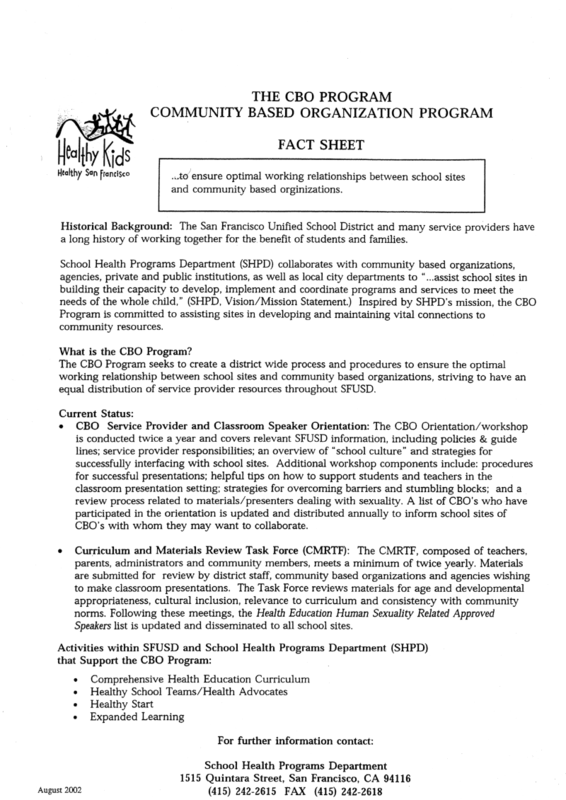 CBO Fact Sheet issued by the SFUSD in August, 2002, disclaiming any responsibility for the nature or message of organizations included in its CBO listing, as long as the topic is not related to sexuality. If the SFUSD thinks it's not responsible for who it allows to lecture its students and what message they deliver, then who does it think is responsible? Responsibilities of the SHPD and the CBO. The SHPD (School Health Program Department) takes no responsibility for the materials or message delivered by the CBOs they list. This is unacceptable. School site responsibilities. The individual schools are supposed to review the content of the presentation with the CBO's speaker coordinator. Why isn't the SHPD vetting these organizations? Why insist that teachers at individual schools discover for themselves, independently, that Narconon is a front for Scientology, when the school board already knows this? School district policy prohibits giving out names and addresses of teachers to third parties. SFUSD violated its own rules by giving this information to Narconon so it could market its services directly to school health coordinators. On January 24, 2004, the school district blocked access to this web site, Stop-Narconon.org. Why did SFUSD want to prevent people from reading this web site? The block was removed on January 27. 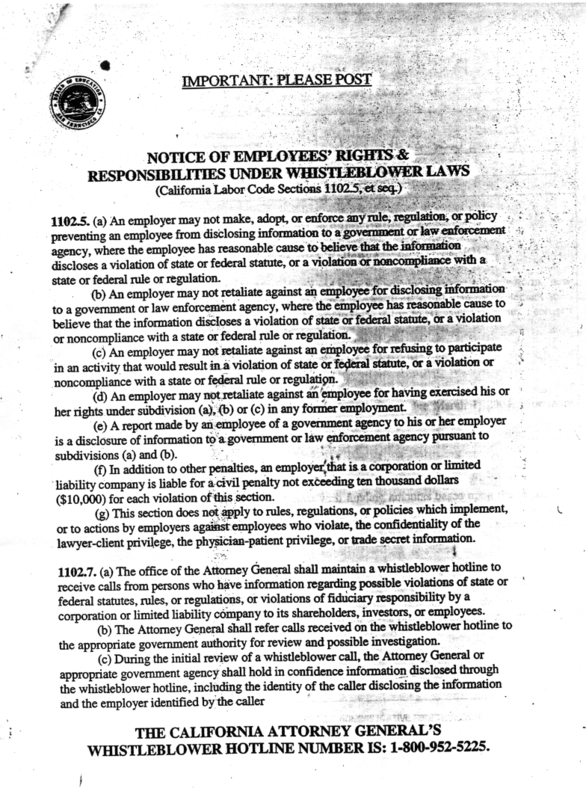 Weekly Administrative Directive from January 21, 2004, reminding SFUSD teachers that they are protected under Federal whistleblower regulations from retaliation for reporting violations of state or federal law. Send a letter to every school in the district informing them that Narconon is not an approved community-based organization, and its inclusion in the current CBO listing was an error. 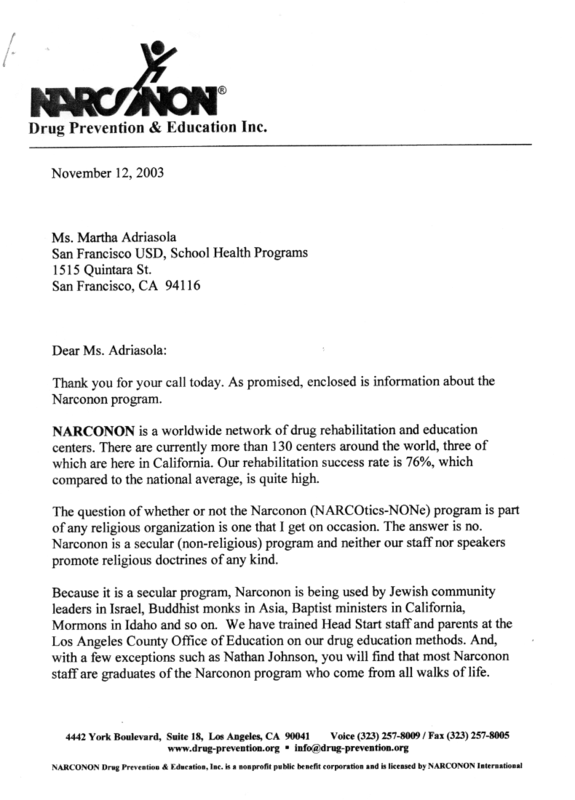 Send a letter to the parents of every child who attended a Narconon presentation in a San Francisco school, telling them that Narconon is not approved for speaking to students in the school district, and that Narconon's ties to Scientology should have been disclosed and parental permission obtained before any presentation was made. Issue a public statement assuring SFUSD parents that neither Narconon nor any other Scientology-affiliated organization will ever again be given access to their children, unless that organization's ties to Scientology are disclosed in advance and written parental consent has been obtained. Letter from Kim Coates on February 20, 2004, complaining about innacuracies in Narconon materials. What she calls "misleading" statements, scientists call "nonsense". Later on she says "not substantiated by any reputable authority", which is a nice way of saying "nonsense". Letter from Tony Bylsma on May 24, 2004, defending Narconon's nonsense. His response is arrogant and reads like a snow job. Letter from Tony Bylsma on June 12, 2004, complaining that "pressure" is being brought on the school district to scrutinize Narconon. Curriculum outline sent by Tony Bylsma to Kim Coates in late June, 2004. Dan Kelly, President (as of January 2004) of the Board of Education of the San Francisco Unified School District. dkelly@muse.sfusd.edu. Tom Ammiano, a member of the SF Board of Supervisors and past president of the SFUSD Board of Education. Supervisor Ammiano helped start the School Health Program which Narconon has now infiltrated. Tom.Ammiano@sfgov.org. This web page is maintained by Dr. David S. Touretzky, Research Professor, Computer Science Department, Carnegie Mellon University, Pittsburgh, PA 15213-3891. Send comments, tips, or documents to: dst@cs.cmu.edu, or phone 412-268-7561, fax 412-268-3608.